I’m thankful I had to be sober immediately after tonight’s episode, or I might be in the hospital. 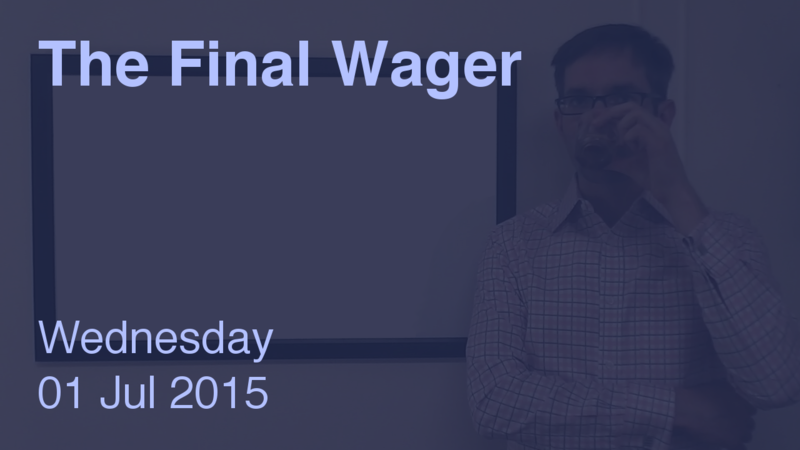 Oh, hey – yet another Penultimate Wager. And this one’s really easy! Any nerd can tell you that double 12,800 is 25,600 – that’s an easy power-of-two calculation. Yet instead of going for $5,601, Alex wagered $5,000! If Alex doesn’t want to risk so much, he should look to lock out Rena – remember that he’d have to have more than second + third to lock her out of contention. $401 is perfect – and as much as $799 to maintain the crush over Brandon (so that Brandon would not have 2/3 of Alex’s score). If Brandon doubles his score, he’ll have 25,600. To cover this all-in wager, Alex will need to wager 10,600. An incorrect response with that wager will leave Alex with 4,400. To stay above his total, Brandon can wager up to 8,400. Rena can wager up to 3,200. A successful doubling will put Rena at 15,200. To cover this, Brandon should wager at least 2,400. Rena would need to wager at least 2,800. She could also wager basically everything if she’s worried about Alex’s small 200 wager. If Brandon makes the rational maximum wager of 8,400, Alex will need to wager 6,200 to cover him. To stay above him, Brandon can wager up to 4,000. Rena might consider risking at least 1,200. We’ll leave that out of it. Rena would have 10,800 with a correct response and a rational maximum wager. No: process > outcome here at The Final Wager. Sorry 401 should be 399?